An exterior view of the original lodge from around 1928 (click on image to enlarge). About fifty miles up the Gunflint Trail, northwest of Grand Marais, there exists one of the most famous lodges in northern Minnesota: Gunflint Lodge on Gunflint Lake. While most resorts have changed hands many times over the years, including the resort where I was raised, Gunflint Lodge has remained stable. Its 84 year history under one family is amazing. Countless individuals and families have paddled or hiked the boundary waters guided by the wilderness expertise and hospitality furnished by the Kerfoot family. The resort was started in 1925 by Mrs. Doris (Dora) Blankenburg and her son, Russell. They sold it to Mae Spunner in 1929. 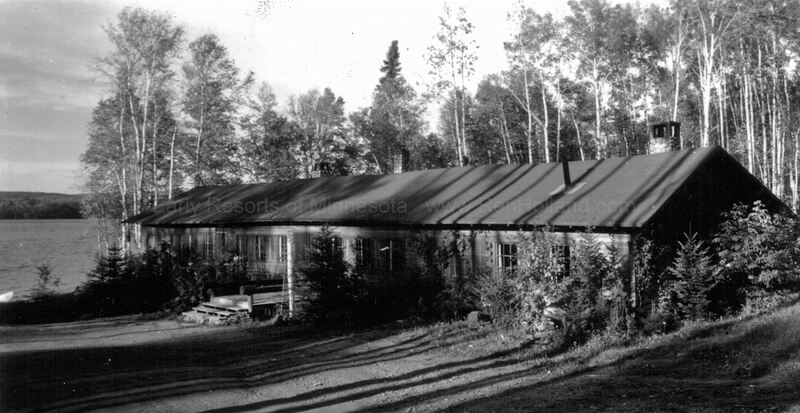 In the 1930s, Gunflint Lodge advertised a new central lodge and cabins accommodating up to fifty guests, a store, gas station, and free campsites. Mae Spunner’s daughter, Justine, became the manager. A canoe outpost, Saganaga Lodge, was built on Os-ke-non-ton Isle on Saganaga Lake, and canoe camps were established on Northern Light, Otter Track, and Saganagons Lakes. However, with the Great Depression, Saganaga Lodge closed. Business improved through the late 1930s and 1940s, and by the 1950s Gunflint Lodge advertised a completely modern American plan (meals served with lodging) with AAA and Duncan Hines endorsements. In 1953 Gunflint Lodge burned. It was rebuilt and became a well known name throughout the state, largely due to the personality of Justine Kerfoot. She wrote a weekly column for the Cook County News-Herald and authored books about her life in the remote border areas of Minnesota and Canada. Not too long ago, my wife and I stopped at the Gunflint Lodge with the hope of meeting Justine. I had read her books, Woman of the Boundary Waters and Gunflint: Reflections on the Trail. We were told at the lodge that she was not feeling well, so she hadn’t come in that day. I didn’t have another opportunity to meet Justine. She passed away in May 2001 at age 94. She was the renowned outdoorswoman of the Gunflint Trail. Justine operated the lodge for fifty years before her son Bruce and his wife Sue became owners. They have effectively operated the resort since the 1970s, expanding it and continuing the tradition of a wilderness resort emphasizing contact with nature. Sue has an informative blog on the resort website. The Kerfoots were instrumental in establishing the Gunflint Trail Historical Society and the Chik-Wauk Museum to preserve the unique history of the area. 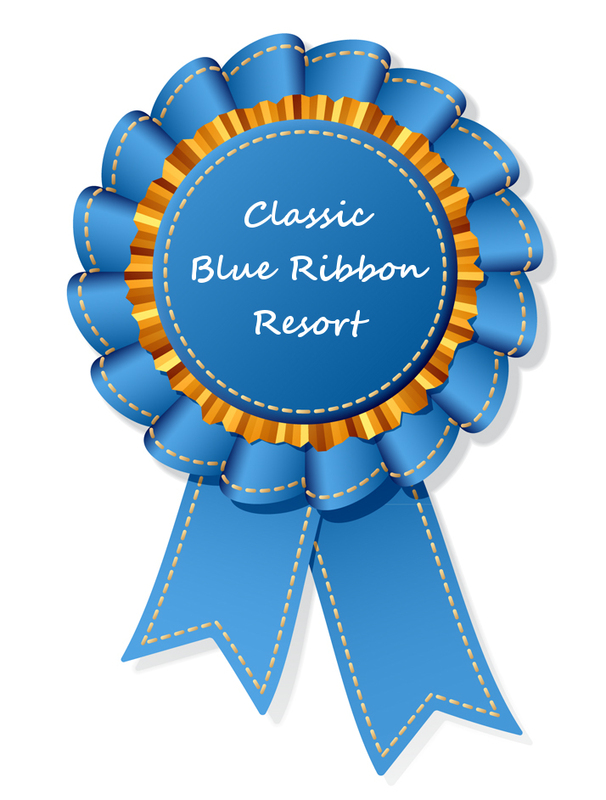 For all these reasons, it’s clear Gunflint Lodge deserves recognition as one of Minnesota’s Classic Blue Ribbon Resorts. 10/4/13 UPDATE: Bruce and Sue were recently selected for the prestigious Minnesota Hospitality Hall of Fame Award for 2013. They will be recognized on October 22 at the Minnesota Resort and Campground Association’s Fall Conference. The award is presented to an individual or couple who have made significant contributions to the development of Minnesota’s resort and campground industry, and are considered “legends” by their peers. Congratulations to the Kerfoots! 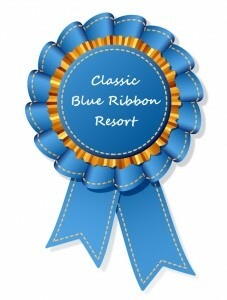 This entry was posted in All blog entries, Classic Blue Ribbon Resorts, Minnesota Resorts, Minnesota Tourism. Bookmark the permalink.